Description: Perfect for your Musical themed cards and scrapbook pages. Made by All Night Media, #375F is called "Musical Note". Description: This is a wonderful wood mounted stamp made by the Stamps Happen Co. A real nice addition to any stamp collection. Very large and detailed! Description: This is a beautiful stamp by the Stamps Happen Company. A full color index on this very detailed stamp. A must have for the musician in you life!! Description: From Stamps Happen this nice stamp is part of the D. Morgan collection. Called - The Magic Of Music. It is a heart with the music notes swirling on top of it. Stamp reads: The magic of music warms the heart and soothes the soul. This is a large stamp for your collection! Description: From Stamps Happen this nice stamp is part of the D. Morgan collection. Called - The Gift Of Music. This has music notes surrounded by the saying: The gift of music... Is a gift... from God. Description: Hey music fans this is a terrific stamp for anyone doing collage work or for someone who plays the Violin. This is the Medium Violin from Stampington & Company. The border says Violin all the way around too. Description: Hey music fans this is a terrific stamp for anyone doing collage work or for someone who plays the Piano. This is the Medium Grand Piano from Stampington & Company. The border says Grand Piano all the way around too. Size: 4" x 3 1/8"
Description: Hey music fans this is a terrific stamp for anyone doing collage work or for someone who plays the Trumpet. This is the Medium Trumpet from Stampington & Company. The border says Trumpet all the way around too. 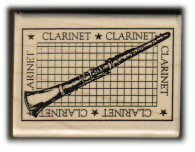 Size: 4" x 2 1/8"
Description: Hey music fans this is a terrific stamp for anyone doing collage work or for someone who plays the Saxophone. This is the Medium Saxophone from Stampington & Company. The border says Saxophone all the way around too. 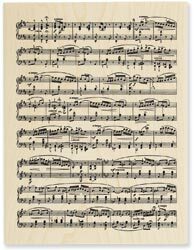 Size: 2" x 3 7/8"
Description: Hey music fans this is a terrific stamp for anyone doing collage work or for someone who plays or reads music. This is the Medium Musical Notes from Stampington & Company. Description: Hey music fans this is a terrific stamp for anyone doing collage work or for someone who plays the piano or keyboard. This is the LARGE Piano Keys from Stampington & Company. Description: Hey music fans this is a terrific stamp for anyone who loves Music. This is the Medium Music Stand from Stampington & Company. Size: 2" x 4 1/8"
Description: Hey music fans this is a terrific stamp for anyone who loves Music. This is the Small Music Stand from Stampington & Company. Size: 1 1/2" x 3 1/8"
Description: This stamp is from Stampington and Company. Add this to your collection of music stamps. Perfect for the Clarinet lover! Description: Made by All Night Media, this stamp is perfect for your card making and scrapbooking ideas. Also perfect for the music lover! It's a small heart made into a musical note. Size: Stamped image is 3/4" X 1"
Description: This stamp is from Stampendous! It is a large stamp of music score. Perfect for backgrounds on your paper crafting! This is a large stamp! Size: Image size is 3 3/4" X 5"